If you are trying to decide what to do with all of your holiday cookie tins, here are some ideas. This is a guide about crafts made with cookie tins. Have you ever been to a yard sale or thrift store and seen a great tin and you knew it would be just the right size to fit that special present but the tin was decorated with advertising. Well I am going to give you some great directions on how to recycle that great tin into something you would be proud to give a gift in. 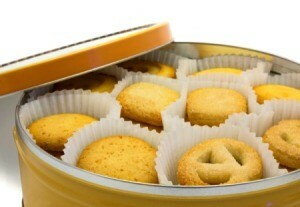 Tins are great for giving gifts in as reusing them keeps them out of the landfill and they can be used year after year. First you take your sanding block and sand the tin until it is no longer shiny. I used a sanding block with medium grit on one side and fine on the other. A sanding block looks like a sponge but it has sanding paper on both sides already attached. You can buy them a Harbor Freight or Home Depot. I liked using the sanding block because it is pliable and could get into the curves of my tin. Next, I set up an old box to spray paint the tin in. Remember when spray painting to use light coats. Spray paint dries quickly but you really want this to be dry before you decorate. Let dry. 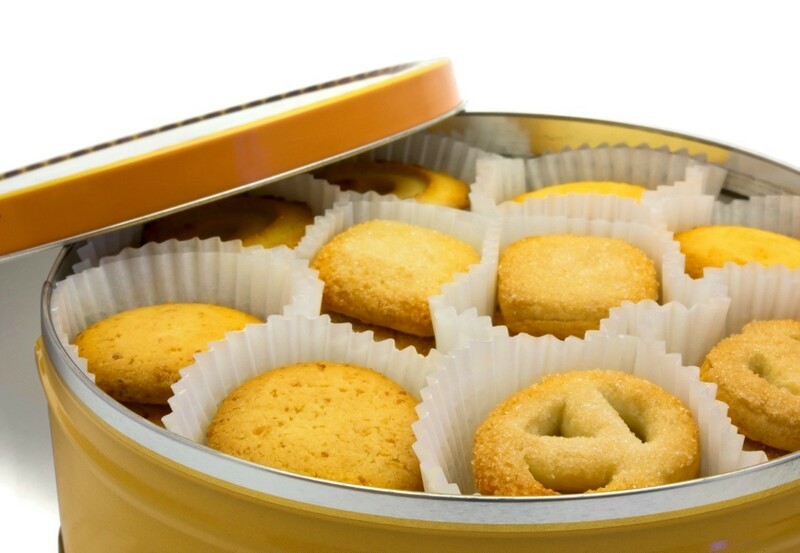 Now is the time to decorate the lid of your tin. You can cut an old Christmas card to fit into the rings on the lid or decorate with a big bow or hot glue on fabric and old Christmas ornaments. This would also be a great way to recycle the Christmas page or any page from your old calendars. I get the nice ones from the thrift stores. Wash them out really good and put cookies or soft candy in them. I take them to nursing home people who do not have a family. I also put flower arrangements in the tall ones. Be sure you rub the rim with candle wax, so it's easy to open. I use tins to store my Christmas CDs in, plus delicate Christmas ornaments, my wrapping scissors, tape, pens and loose gift tags. The larger tins I use to store my Christmas DVDs and video tapes. Old Christmas cards can be stored in the larger tins also. This is a "keeper" for miscellaneous items made from an old candy tin. 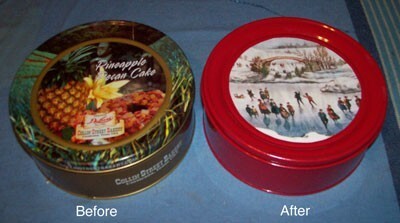 A fruitcake tin or cookie tin can also be used. 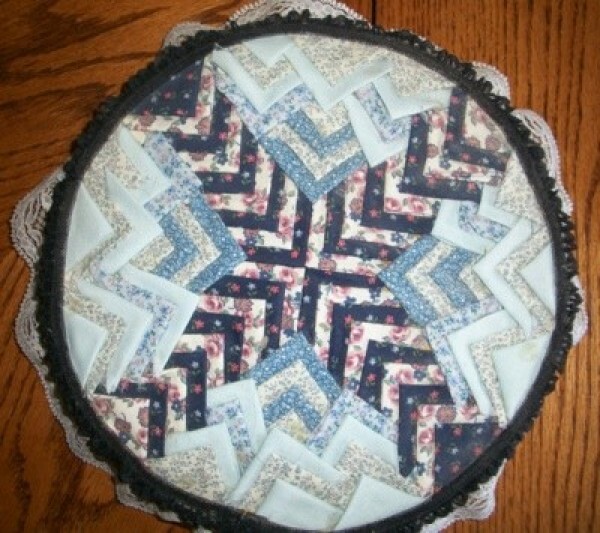 Cut small scraps of fabric into two inch squares and fold into a triangle shape. Press the triangles and allow to cool. Decide on a pattern in which to arrange your triangles. Carefully start in the center of the design and begin in a clockwise pattern to begin gluing the fabrics into place. Overlap each layer of fabrics and finish the design with as many shades and patterns of fabric as necessary to completely cover the top of the tin. Use miscellaneous fabric of your choice to cover the bottom of the tin. I find that tacky glue works better to glue the fabric to the tin, but the embellishments go on fairly well with a hot glue gun. Weight the layers of glued fabric pieces as you go, as to ensure they don't slide off. As each layer dries, or is more stable, add another layer of scraps until the project is completed. I have done many tins like this. They make nice storage containers for buttons, jewelry, etc.